HILL TRIBE SILVER DAISY PRINTED MANGO CHARM. Each piece is approximately 9.5 x 22 mm in size. The price and weight given is per piece. The minimum order is 5 pieces. 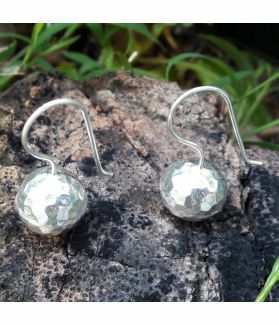 This Hill Tribe Silver charm has a purity of 99%, and has been made by the skilled hands of the Karen Hill Tribe Communities & artisans of northern Thailand. 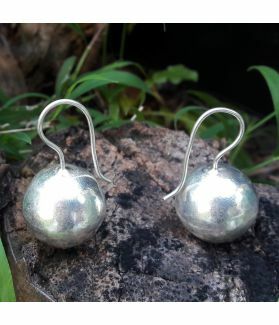 Due to its high silver content, it is also known as “fine silver”, with features of a softer texture than sterling silver, but of higher quality and less rusting. The valuable knowledge of Karen Silver Handcrafting has been passed down through generations, beginning centuries ago. 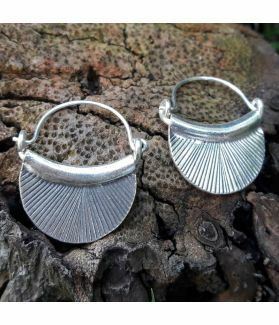 Every piece is inspired by the daily experiences of the Hill Tribe people, allowing them to express themselves emotionally and present their personality in the silver. Every piece is made completely by hand, which means that pieces with the same design may not turn out exactly the same; making each charm a truly one of a kind beauty. This Hill Tribe silver charm can be part of your beautiful jewelry creations.